Welcome to week 1 of the Virtual Curriculum Fair. This is my first year participating but I have always enjoyed the posts shared. For week 1, the theme is See How We Learn. The VCF is hosted by Susan @ Homeschooling Hearts & Minds. This will also serve as the Middle School Monday post for today. With the preliminary information out of the way, let’s jump in. I don’t know about you but it seems to throw me for a loop often. It seems like no matter how well things are scheduled or planned, a wrench ends up in there causing havoc. Due to that unpredictability, I loved working without a set time schedule. It worked well for us the first couple of years. We just jumped in when we were ready each day, did our work (which was basically a checklist), and then were done. I wrote things down as we went along and kept records as needed. Last summer, we re-evaluated it all due to struggles we were having. And we gave the girls some input on whether they wanted time blocks or lists or to be told item by item what to do. We ended up with one of each kind. That’s okay, though. It works. And it helps us deal with changes to schedules, doctors appointments, illness, the blues, or just the crazy hectic schedule we ended up with this year. completing school work – each of these discussions was different because one chose a blocked time schedule, one wanted a list so she could “do the next thing”, and the other wanted to come to us for each of the items on her school list for the day; just for a note: I do have a blocked schedule written out for each of the girls just in case and to help me stay on “schedule” but they don’t have to work by it. 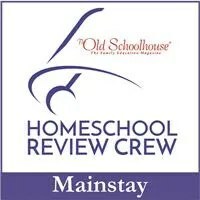 This discussion was perhaps the very best things we have done so far with homeschooling. I forget sometimes that clear expectations make it easier to actually MEET those expectations. For me and for the girls. So by us taking the time to include the girls and be clear about what we expected, it has placed more responsibility on each of them and they have become stronger because of it. Is it perfect? Nope. We still have plenty of days where things don’t get fully done or where attitudes (mine and theirs) are less than ideal. But overall? This has been a wonderfully freeing choice and it is very simple to remind them of the plans and expectations. They then take a deep breathe, reassess, and move forward on a better path. Most of the time. Another thing that has made a huge difference in accomplishing what we need to? Me. Yep – I make a difference. If I am not doing well, am in a bad mood, or didn’t sleep well, it can easily affect everyone else in the family. I soooooo wish that were not true but it is. Another example of that accountability and responsibility we talked to the girls about. So, I have tried harder to take the responsibility for setting the daily tone. Some days I do well. Other days? Well, not so much. Still, what have I found that makes it easier for me to hold my temper, speak kindly, or have the patience necessary to teach math when no one wants to do it? I need a morning routine just as much as the girls do. This works extremely well for me most days. Some days? We still hit bumps but that is life. Welcome to our imperfect life where we love each other fiercely (sometimes more loudly than others), love God more, and work together to learn and grow and become the women God created each of us to be. All this with the help of the lone male around our house, At Home Dad. Come on in and enjoy life with us. The following VCF participants have written their take on the theme of See How We Learn. Next week we will be addressing the theme of Playing With Words: the Language Arts. Until then, please take some time to go visit the blogs of these homeschoolers. And even more ideas can be found by clicking through for the Linkup! Middle school scheduling seems to change daily sometimes. It can be so tiring. But, changing we are. This time, we have put a ton of thought into what we are going to try. Additionally, we have put some parameters in place for helping ensure that the schedule is followed. And, third, we gave options to the middle schooler and took her answers very seriously. So, here is what we are doing for her this year. This is where we are starting and we have acknowledged that some students work well with only positive reinforcement. Some need the possibility of negative consequences to do what is required. We have chosen a couple of possible consequences for the girls if they are not ready to start school on time. I am not looking forward to having to enforce this but we are prepared just in case the situation arises. Since we discussed options for this schedule prior to its writing, we do not foresee issues. If there are some, we will change her to what is going to happen with her sisters. Their schedules are still set with a start time and have noted the days and times that we have scheduled activities, such as dance or Art Center classes. But, the big change is that Miss L and Miss J will be working with checklists. This will be the concept of “get started, work hard, and get done.” Check things off as you go and all will be good. Here are their schedules. I am sure there will be days when this just won’t work but that is the beauty of home education. We can change things to help them work so that the girls are getting what they need, rather than what fits the majority. I always enjoy looking at other families’ schedules. Please share them with me if you have a post written about what you are doing. 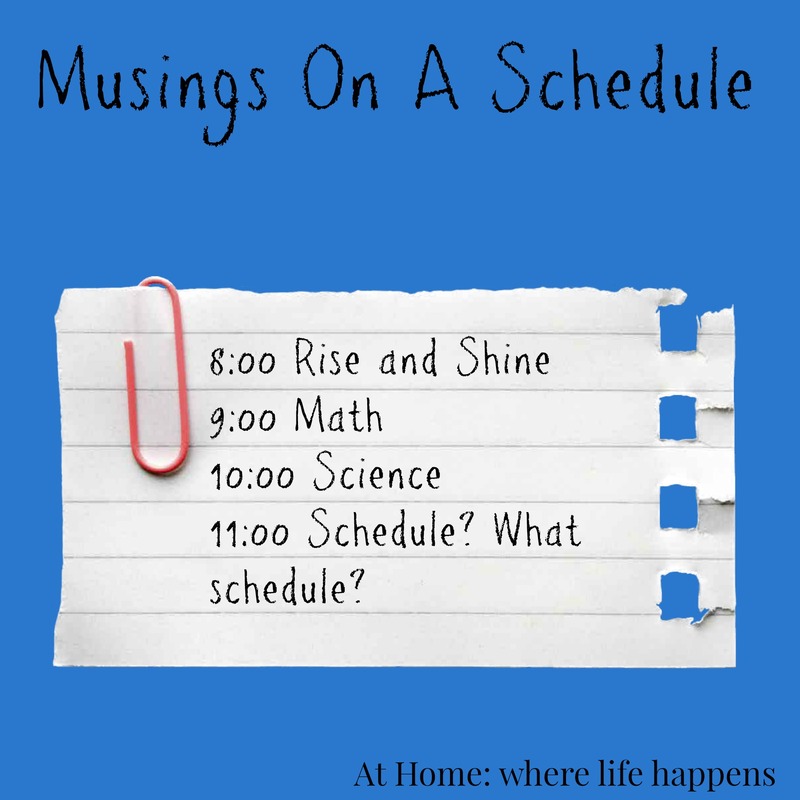 As I mentioned last week in my Middle School Monday post, I have been musing over schedules. I have decided what we are going to do as far as a schedule goes. I’ve pondered and played a little bit with time allowances and such since last week. And one single thing made the difference – responsibility. I did a couple of things this last week to see if some specific things worked or not. One was to let the girls have a few minutes of play time after breakfast. This didn’t seem to affect their work ability, except that if they got involved in an in-depth pretend then they didn’t want to stop. And THAT did affect their work ability. Another thing I did was to let them have a short amount of TV time (watching a single 20 minute episode of something) before starting work. This did NOT work. There is a desire to keep watching and watching and watching, which did not end well with attitude and work focus. The last thing I played around with was to have a relaxed wake up time and breakfast but require school to get started by 8:30. That is pretty early for us. But, I like this one. And I’ll share why. It gives the girls and me a relaxed wake up and breakfast schedule. I have time to drink a cup of hot tea and read my Bible. I also have time to glance at the lessons for the day and see if I need to do something or change anything. It gives the girls the ability to read a bit or play a short bit if they get up and at’em. It keeps our focus for the morning. The girls have the choice to either buckle down and get it done and have plenty of time to play OR to dilly-dally and waste time and allow their school work to take them all day. This last one is the responsibility I mentioned earlier. The choice is the girls’. I need to give them the chance to grow in responsibility, at an age appropriate level, rather than dictating every single thing to them. I have a list of what needs to be done and a couple of extras for fun if we have time and desire but there is a “must do” list. This “must do” list can take them a couple of hours or all day long. It is up to them. Miss E’s will naturally take longer than the other girls because of her status as oldest. This gives her the privilege of having a couple of extra things she has to do each day. But, really, it shouldn’t take her much longer than Miss L’s list if she’ll buckle down. So, while it isn’t a strict, every-subject-at-a-scheduled-time type of schedule, it is a schedule of sorts. Miss E still has the ability to pick and choose which order she’ll complete things in. And that kind of freedom will help her learn responsibility. We’ll see how this goes for a while. I may have to revisit it again in a couple of weeks or it might last us for a good long while. I am hoping for the second option, here. Next Middle School Monday, I will share our curriculum. We have revamped it for a couple of reasons (see Goals) and I really like a couple of things we are doing. Years ago, when I had two young children, another mother and I had a discussion about schedules. Her family ate dinner at 6 PM and were in bed by 8. She had four children, the oldest around 6th grade or so at the time and her youngest at that time was the same age as my child. Her husband worked in the public schools, so he was off by that time most nights. This was an easily consistent schedule for them most of the time. We lived in a very small town and my husband was going to work at 6 PM that year. He was just beginning to get ready for work at 5; if we had dinner before he left, it would have been at 4 or 4:30. So, we had dinner at 7, because my husband could generally get off for 30 minutes or so at 7 and we could eat as a family. Plus, he could bring co-workers with him and we could have some “getting to know you time” with them. It worked great for us! After dinner was cleaned up, I got the girls ready for bed, read to them, and they were generally asleep by 8:30 or so. It worked for us. My friend’s comment has really stuck with me, for probably close to 10 year now. Her comment was not intended to be mean or hateful or judgmental. It was just what struck her at the time. She said “How can you do that to your kids? Putting them to bed on a full stomach? !” Now, our schedule was really not that different from hers except that it worked from 7 – 9 instead of 6 -8. But, it has had me thinking ever since then. Do you compare? Your schedule? Your educational choices? Your work choices? You family choices? Your clothing? Your house? We all do and that really isn’t bad, if . . . If you don’t beat yourself up over it or decide theirs is always better or yours is always the lesser of the two. I have been musing on schedules because I am trying to decide what will work for us. What we are doing isn’t working as well as I would like. So, I am comparing. Especially for the middle schooler. See this comparison of our family and my friend’s family is kind of what all of life is like. What kind of schedule will my child have when she grows up? Well, it depends on what she does in her adult life. Will she work an 8-5 job? Will that job be one that is tightly scheduled for her, like a teacher’s schedule is? Or will she be in a position that requires her to meet deadlines but doesn’t tie her down to every step along the way? Or will she be self-employed and have to schedule it all out herself. Most likely, it will be somewhere between the two extremes. We need to ease into something where she has enough structure to not quit or fall behind but not so much structure that she doesn’t learn to set her own markers along the way to her ultimate goal. 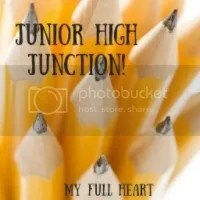 So, when I am hunting down examples of a schedule for a middle school student, I tend to shy away from those that are highly structured but I know that we need more structure than we have now. This is truly just a musing because I don’t have an answer of what we are going to do as we get back to a full schedule after the holidays. But I think we will start with a conference to discuss what I would like to see from her and hear what she thinks she might need to be successful. Maybe that will help direct my thoughts and ideas to something more concrete. I would love to know your thoughts on scheduling and teaching students to schedule for themselves.